Original designs in cat furniture are rare and generally expensive. But by purchasing cat products from the Cat Above, you get reasonably-priced distinctive artisan designs made by true cat lovers, and you help support an inventor, a small business, and your favorite animal shelter. It's obvious that the folks at Cat Above come from a place that all cat lovers will appreciate. They are cat rescuers, they give their spare time to educating humans about caring for cats and help to place shelter cats in new homes. The Cat Above also shares a portion of its profits with its local shelter, the Cat Adoption Team in Wilmington, NC, or the cat adoption center or shelter of your choice, as long as that shelter does not euthanize animals. Cat Above has designed three unique products so far, but I have no doubt they'll be more. 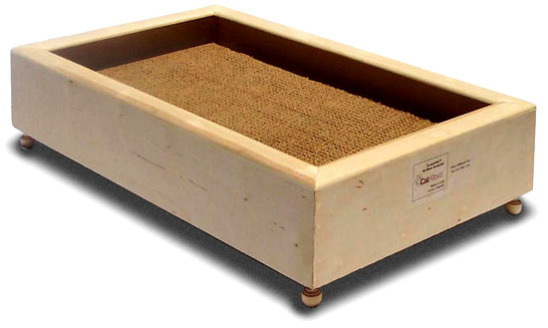 Here's a very durable and mobile Cat Hammock With Wood Stand that has a patent pending on the stand, a unique fold-up, light-weight, but sturdy and durable hardwood frame that can be moved around the house or taken on trips. The hammock itself is the only part you may have to replace at some point, but it too is very sturdy and two-sided to keep kitty cool in summer and warm in the winter. All hammocks are machine washable and you have your choice of three color combinations for the hammock. 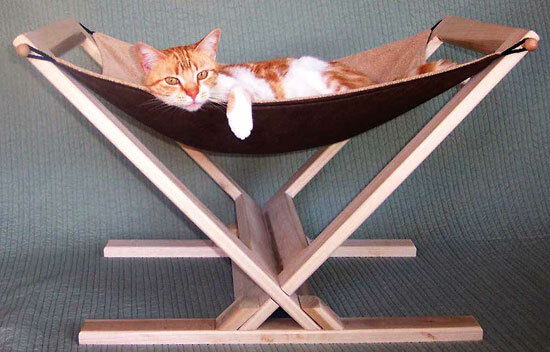 The Cat Hammock With Wood Stand is $79. 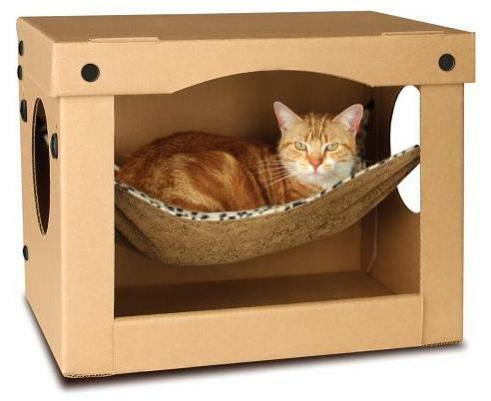 The SnoozePal™ Cat Hammock is another patent pending cat hammock, but in a very sturdy sculptured cardboard box! This, with two escape hatches, has a reversible hammock, like the one above, that holds up to 20 pounds of cat. The box ships flat and, like the wood stand above, is easy to assemble. $35. So far, the Cat Above has demonstrated its commitment to making cat furniture part of a home that loves cats. Their cat products are built to last, as opposed to the many more common consumable cat products on the market. I think I would enjoy having them as much as my cat enjoys napping or scratching on them.